Prior to becoming a household name in the highly competitive entertainment industry, I Go Dye, an Ambassador of Peace to the Youth of Africa, has been shown cold shoulders four times by the organisers of the very popular comedy show, Nite Of A Thousand Laughs. But as no man curses who God blesses, the Almighty used the editor of Encomium, Azuh Arinze, to place him on the highway to success by giving him the long sought-after opportunity to perform at the REEL and AMEN Awards of 2000. On that fateful day, he displayed an incredible talent that got the audience agreeing that he was a comic to watch, a 'prophecy' that has now come to pass. Today, no comedy show is complete without Francis Agoda. I Go Dye has featured in all comedy shows ever held in every nook and cranny of this country including the biggest of them all, Nite Of A Thousand Laughs. If you like, he is the rejected stone that became the cornerstone. Little wonder, the America Critic Magazine described him as "Africa's next king of comedy" after his scintillating performance at the Nigeria Re-union Show in Dallas, Texas. 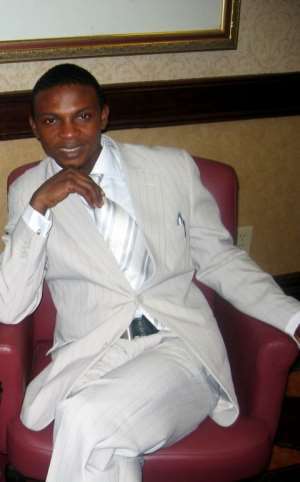 America Star Television said: "I Go Dye is the most spontaneous African comedian, no doubt." Based on his artistic persona, the humour merchant has garnered a handful of plaques into his kitty, including Creativity Art in Africa (CAN)as Africa Best Comedian; TV People Entertainment Award (held in New York)for Best Creative Comedian in Africa; London Movie Award (LMA)as Best Comedian in Africa; National Comedy Award (NCA)for Best Comedian in Nigeria; and Best Niger Delta Comedian. The list is endless. On how his stage name came about, he said: "The name I Go Dye is a direct coinage from my surname, Agoda. I chose the name because it is catchy and one can easily relate with it. Though often, people mistake it for 'I go die' as against I Go Dye. I don't know how you interpret my name because I have seen people bear Lucky without luck, it depends on how you interpret your name and the faith you have in it. As for me, success, happiness and transformation are my interpretation of my own I Go Dye." I Go Dye's journey into the world of entertainment started at age 13; then, he used to entertain people by presenting 'Mock News' on Delta Television, Warri, with his friend, Otas, now known as I Go Save. This young comic has taken his comedy artistry to all parts of Europe, America, Asia, and other parts of Africa. For him, comedy is not only about making people laugh, it is also about fighting vices. "I do not only tell jokes that will make people laugh; I use my time on stage to also crusade against social ills," he told Entertainment Today shortly after performing at this year's Nite Of A Thousand Laughs that recorded what its originator, Opa Williams, called the highest crowd in the annals of the show. His ability to use his joke to attack social vices earned him endorsement by former Nigerian Ambassador to Germany, Prof. Tunde Adeniran, who hosted him during the AFFA Integration tour in Germany, his first Europe tour in 2005. He has also been hosted by the Nigerian Ambassador to France during the Nigeria Cultural Week in Paris. This comedy impresario, whose brand is anchored, has opened and closed shows for some of the big stars like Chris Rock. He has his own comedy show tagged 'I Go Dye Standing', a show that made its debut in Warri, Delta State, but has been staged in Holland, Belgium and Germany. The comic has been able to find his way into every home in Nigeria and beyond. He disclosed that his decision to go into full-time comedy as against Engineering, which he had flair for as a child and which his parents had thought he would take as a career is because "comedy is a profession like every other profession and I chose it not because of anything but for the love I have for the entertainment industry. I have been an entertainer from my childhood days. At the age of 13, I started presenting 'Mock News' on Delta Television in Tunde Omonode's DTV Top Show with Otas now known as I Go Save in Warri." He draws inspiration from what he called the unique people of Warri. "I like everything about them, especially the way they speak (pidgin); it is different from the way every other people speak," he said, adding that what sets him apart from the other comedians is his descriptive power. His words: "I think my descriptive power differentiates me from others; I have a way of describing a situation and bring it to life so that the people can easily feel it and know where I'm coming from. "Again spontaneity; I don't crack jokes, I pick up national issues as it relates to our everyday lives and discuss it on stage in a humorous way." Despite his position in the industry now, I Go Dye said what he considers as a threat to 'big' comedians is the up-and-coming ones. "This is because I don't know what they have up their sleeves, and who knows they might even change the entire comedy trend we have set a long time ago." Though he was unable to hold his 'I Go Dye Standing' show in London last year, due to tight schedule, he has promised, even two months to the end of the year, to take it to London and the United States. Benin and Warri will feel it in October, with Lagos and Abuja taking their turns in December. "This show gives me leverage to perform for up to 90 minutes at a stretch unlike other shows where I feature for about 20 minutes maximum," he revealed. Though he would not want to disclose how much he gets for making people laugh, he has also not lost anything for not living in Lagos like his colleagues in the business saying: "Everybody must not live in Lagos to be relevant. Usher and a host of others came to perform sometime ago in Nigeria, but they don't live in Nigeria. When you are in high demand, you would be sought after and your only choice would be to be available when you are needed." He claims not to have any role model in the industry, but was quick to single out Opa Williams, RMD, Julius Agwu, BasketMouth, I Go Save, Chico Ejiro, Peter Igho as some of the people he respects because of their achievement in the industry.